Groove Tubes has been manufacturing, importing, and grading quality power tubes for two decades. Groove Tubes founder and energy source Aspen Pittman has paid us numerous informative (and always entertaining) visits through the years. His tireless pursuit of perfect tube tone has resulted in Groove Tubes' reputation for consistency and premium quality. Want proof? Fender tube amps now include Groove Tubes as standard equipment, and true tube aficianados worldwide swear by the tubes and pro audio products Groove Tubes makes. For premium tube tone, choose Groove Tubes! The GT-ECC83S preamp tube represents the classic "Euro" type tube, with medium to high gain and a linear frequency response. The GT-ECC83S gives you a very clear, even tone with good bass character. 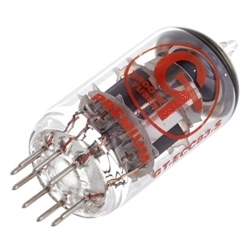 This tube type was long used as standard equipment in Marshall and Vox amplifiers. For those who change first stage gain preamp tubes to change the character of their amps (remember, this can be done in less than a minute without tools, adjustments, or a "tech"), the GT-ECC83S is definitely an essential.